Many effect size indexes can be calculated on the back of an envelope or using nothing more than a Spreadsheet. 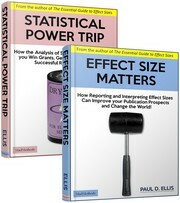 Other effect size indexes are generated automatically by statistical programs such as SPSS or STATA. Still, for those of you who want something flashy, a set of seven easy to use calculators can be found on the Resources page (or just click here to be taken straight to the calculators). You are currently browsing the archives for the effect size calculators category.